RadDiagram provides a powerful set of RoutedUICommands that help you work with your RadDiagram and its Items easily and build better MVVM applications. 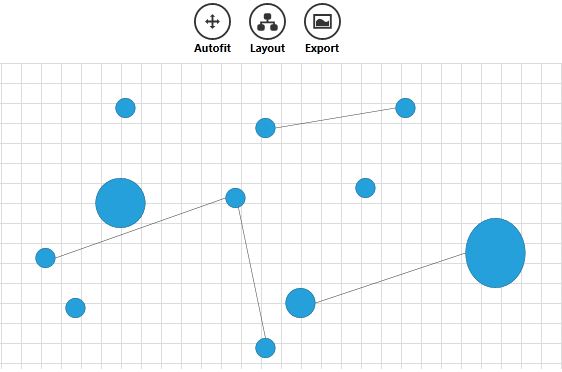 AutoFit - Centers and zooms the diagram to display all items. Duplicate - Duplicates selected item/s. any number - if you provide a number in the CommandParameter, this number would indicate the number of pixels to be used as a step for the Nudge command. SwitchGridVisibility - Hides or shows the background grid. Load - Loads a diagram. Below is shown how you can use some of the Diagram Commands in an application Note that this syntax is common for every Diagram Command. <telerik:RadGeometryButton Height="55" Width="55" ToolTipService.ToolTip="Export As Png" Foreground="Black" Background="White" Content="Export" Command="telerik:DiagramCommands.Export"
You can customize the functionality of the Delete, Export and Align Commands currently. Align - you can pass Top, Left, Right, Center, Middle, Bottom as CommandParameter. Export- you can pass Bmp or Png. The default export format is Png. Delete - you can pass the item you wish to delete. You can see how to replace the default behavior of a command in the Override Diagram Command help article.